I didn’t get any leveling done this weekend. I got sidetracked by something. No, no, not a new game. Not D3 either. Friday night I was running around with Averry. He wanted to go to MC and BWL, and I decided to take Van because he needs rep and also because the character that Averry was bringing couldn’t use 2 handers and I would cry if Ashkandi dropped when no one could mog it. Averry mentioned that it would be more important to have someone who can use the legendary drops in MC. I sort of scoffed at this. I mean, what are the odds of any of those dropping? I’ve seen one binding in all the years I’ve played. 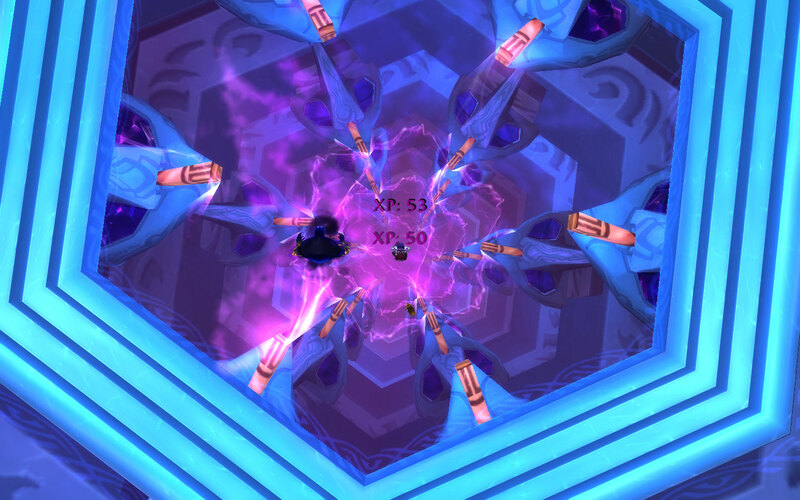 So of course, just to prove me wrong, the Eye of Sulfuras drops. You can guess what I spent the weekend doing, right? I’m going to have to craft a Sulfuron Hammer to fuse with that Eye in order to get my legendary. So off I went to Wowhead. I happened to have one Sulfuras Ingot in my guild bank, and Kirgra just happens to have a BS skill of 305, when 300 is needed to learn the pattern for the hammer. I also gathered the 20 gold bars, 10 truesilver bars, and 2 Star Rubies that were needed for her to learn to smelt dark iron. This all required two separate trips to BRD however, because I hadn’t even thought about the dark iron until after I went there to get the BS pattern. So, the hammer requires 8 Sulfuron Ingots, 10 blood of the mountain, 10 Fiery Core, 10 Lava Core, 25 Essence of Fire, 50 Arcanite Bars, and 20 dark iron bars. 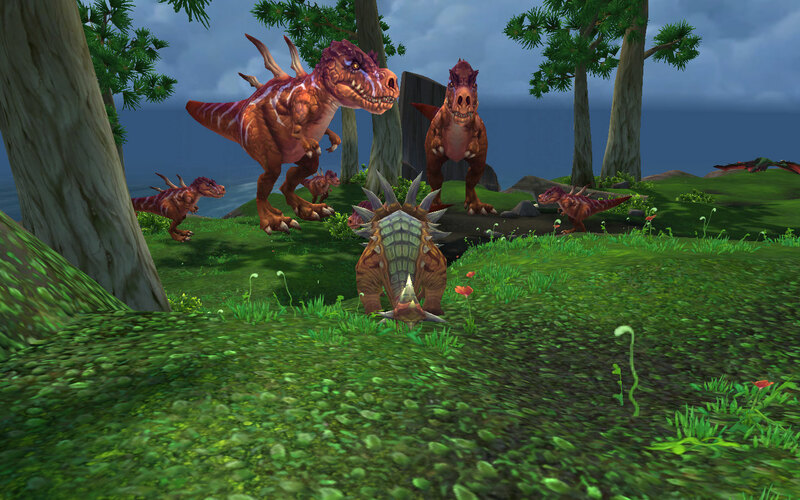 I remember helping Hartbane gather these things way back when. Well, now it is my turn. Arcanite bars I wasn’t even going to mess around. I bought two stacks of Arcane Crystals and a bunch of Thorium bars on the AH and put Van to work transmuting. You want that hammer you gotta do some of the work, elf! Fortunately, he’s transmute specced, so I only had to buy two extra crystals past the two stacks. So, what do we have left? Sulfuron Ingots and blood of the mountain. The ingots only drop off of … I should know his name without looking it up after so many runs this weekend. Maybe my brain is blocking it out because I never want to see him again? Oh yeah, Golemagg. Anyway, that’s a chance of getting one per week per character. Thanks to Averry and my many alts, I have 7 already. Blood of the Mountain can be had from mining dark iron nodes, OR can drop off of Molten Giants and Molten Destroyers. I managed to collect 6 of these. Yes, I actually ran every single alt that is 85+ on Kargath-Norgannon through MC this weekend. Instead of leveling, they were working. AND the route I used to get to Blackrock Mountain was flying up from the Blasted Lands, so I made them all detour to Karazhan and kill Attumen. Obviously the horse didn’t drop or this post would be quite different. Anyway … this still gave me practice on the new classes. AoE practice especially, something I don’t do a lot of when questing (not counting the prot paladin, who pulls as much as he can.) 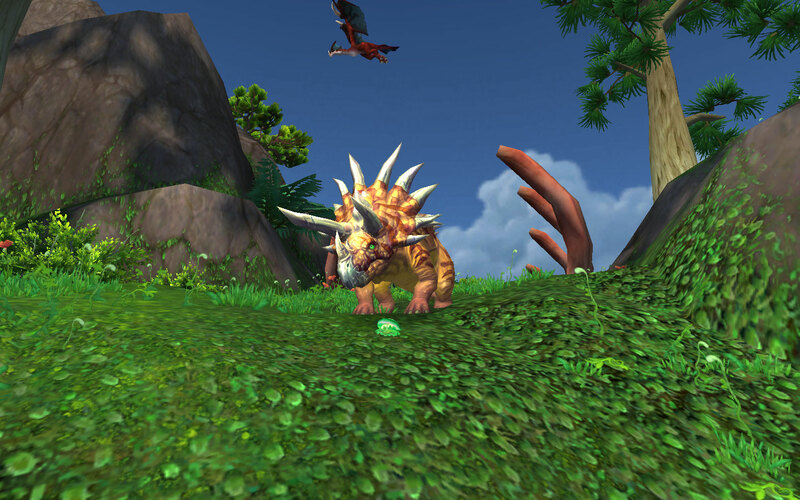 Ok, maybe the balance druid didn’t need AoE practice. The rogue, he just vanished and ran away when he aggroed the packs of core hounds in Magmadar’s room. The shaman learned about fire nova (I didn’t even have it on my bar prior to this.) Adryen found a new respect for the Spinning Crane Kick that all of the other monk players I see use almost to the exclusion of any other abilities. Vorta learned to love Berserk … and hate the long cooldown on it. 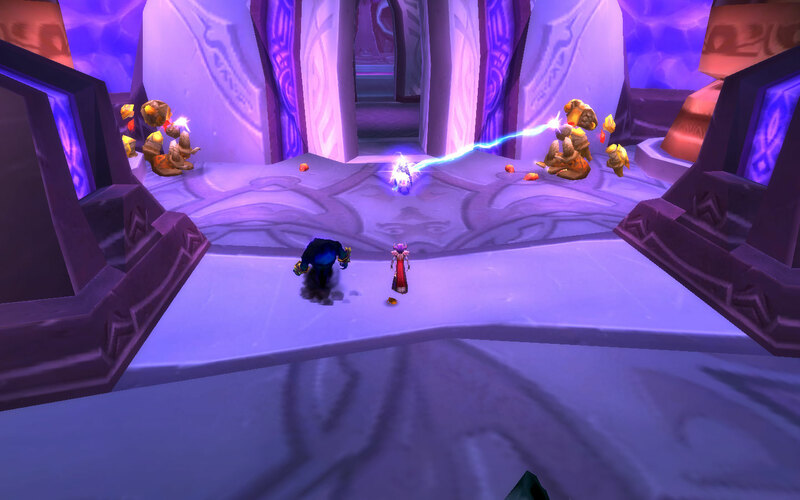 The prot paladin? Um … he couldn’t kill them. He tanked them all the way through the instance, clear up until Ragnaros died, and then just ran them all to the entrance and escaped out the portal. LOL! It was silly, I know, but I kinda of enjoyed having a wall of drooling monster dogs in my face the whole time. Hey, it gave me nonstop Avenger’s Shield procs! Good times. 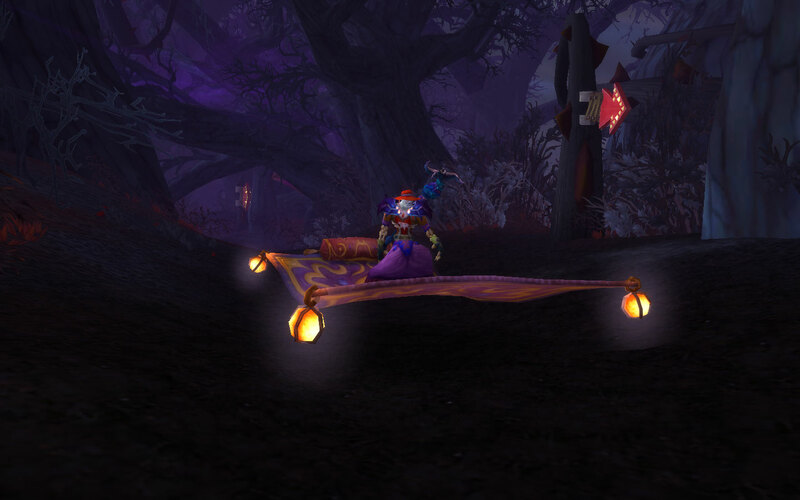 I really love the Darkmoon Faire. Everything about it … the games, the profession quests, the fairegrounds themselves … is such a huge improvement over what it used to be. 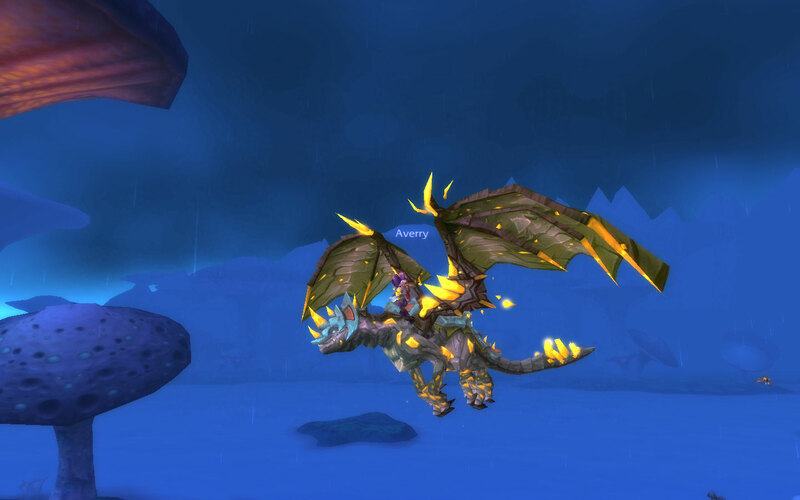 I have all the pets and mounts, but I still go. I’m working on upgrading heirlooms next, I think. 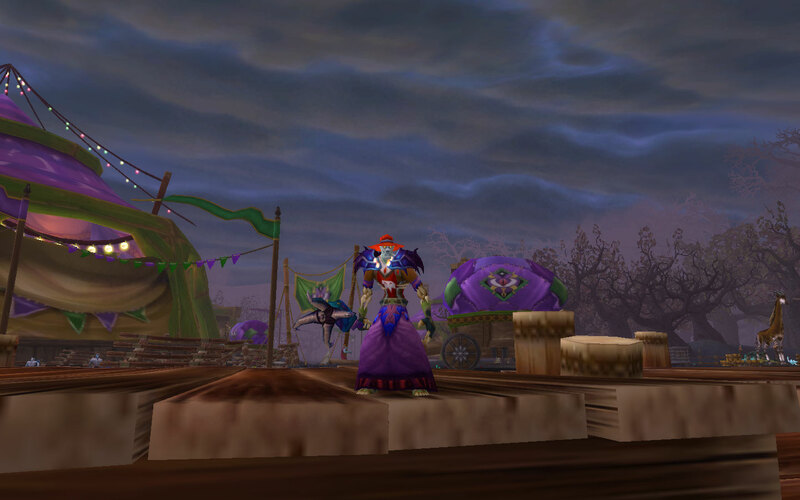 The timing for this month’s Faire was just perfect for Madorsa, as she moved from Northrend to Cata. Her enchanting leveled right up with no issues, but I got bogged down on the tail end of Northrend tailoring. Seriously, just to get from 410 to 420 so she could do the quest at the Faire to finish it off, each recipe took 9 bolts of cloth from 410 to 415 and a whopping 12 bolts (plus 12 infinite dust of which she has a near-infinite supply) for each frostweave bag to get from 415 to 420. Averry helped out a lot, sending me every scrap of frostweave he could dig out of his alts’ banks, but I still ended up spending a good four hours over the course of three separate farming sessions on Kirgra to get enough to finish it. If I’d had to also get enough to get from 420 to 425 I think I would have had to break something. And yes, you’re getting screenies of Dyle again because I am so in love with his transmog.